This "nail house" resulted from residents who refused to move. 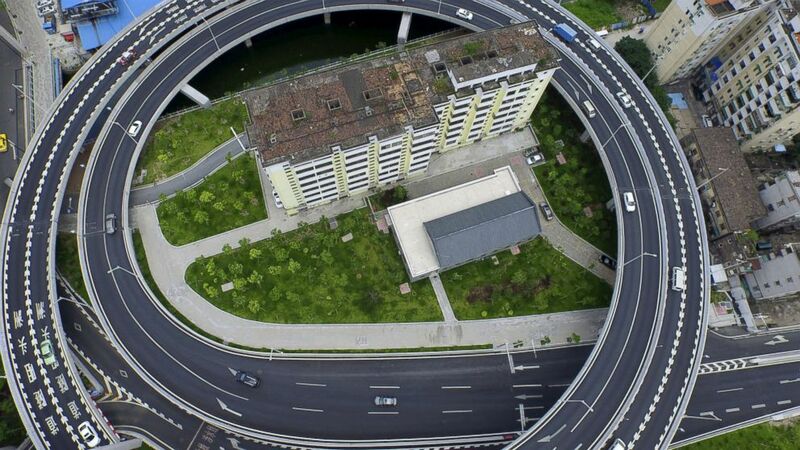 camera (China Stringer Network / Reuters) An old residential building is seen surrounded by a newly-built ring viaduct, June 18, 2015, in Guangzhou, Guangdong province, China. Several tenants refused to move out of a Chinese apartment block that was set to be demolished in 2008 to make way for a road. So, rather than negotiate further, developers built a huge road around the building. Although the Guangzhou residents were offered compensation for their apartments, those who remained had reportedly sought higher offers. There are many examples of partially demolished apartment blocks sitting in the middle of roads in China. Residents of such “nail houses” often do not believe the government offered them adequate compensation for their property. It is illegal here to demolish property without an agreement, but developers in the past have reportedly cut power and water to the buildings in order to drive out stubborn residents. Property owners have also reported being threatened by gangsters. 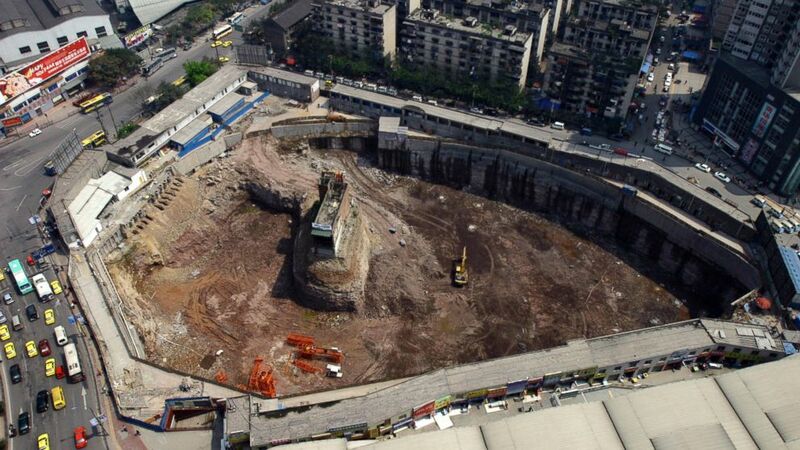 (Stringer Shanghai/ Reuters) A couple, Yang Wu and Wu Ping, in Chongqing are holding out against property developers days after a court ordered them to abandon their home, the home has become an island surrounded by a construction site, as seen in this file photo, March 29, 2007. One of the most famous nail houses belonged to Yang Wu and Wu Ping of Chongqing. Developers dug a 33-foot-deep pit around their home-restaurant in an attempt to force them out. In rebellion, Yang Wu, a local martial arts champion, reportedly used nunchucks to build a ladder up the pit, and threatened to beat up any official who tried to evict the couple.